I grew up with the stories and the cars and the guys my dad worked with to build amateur race cars on nights and weekends, all in preparation for one hot week in Utah in August. Bonneville Speed Week was a highlight of his summer for many years, the one time he got to escape from being a husband, father, and office worker to go up to the salt flats and play with cars. This year’s Speed Week is coming up (August 11-17), so I thought I’d do a little picture show of some shots from the family archives. I don’t know all the names, but the pictures kind of speak for themselves. Yep, that’s my dad with a PBR in hand. No clue who the rest of the people are, but I love this shot because it looks like a beer ad from the 1950s. I’m pretty sure that’s my brother holding the black hat. That car was built from the ground up to race here. I do know two of the guys here: Nonnie and Joe Huss, brothers and two of my Dad’s best friends for many years. Nonnie had the space to build cars, Joe owned a gas station, and both of them were ace mechanics, like my Dad. Old Gold – looks fast, doesn’t it! One of the key points of Speed Week is that if you’re a member of SCTA (Southern California Timing Association), which sponsors the events, you can race almost anything with a motor. This was back in the day when “stock cars” meant cars from the dealer’s lot, not the hand-built, streamlined things they race in NASCAR now. How stock? My dad once took his leased company car up there in the late 1950s, tuned up “a bit” from when he got it, and time-trialed it to 140 miles an hour. Several months later, when he turned in the car, the report came back that it was in good condition, except that they had found a lot of salt in very odd places during the post-lease inspection! And to close out the post, here’s my dad at his happiest. For those of you who only knew my dad in his later years, this photo is how I always think of him: working on cars, getting a kid to help him bleed the brakes, swearing (just a bit!) when things got messed up, and mostly just happy whenever he was around fast cars. The secret of joy in work is contained in one word — excellence. To know how to do something well is to enjoy it. People see my car and trailer plates and say “Oh, you’re from Washington!” which is true but not really true in the sense that it’s my home, or my home base. It’s gotten me to thinking about “a sense of place” in my life, where I belong, and where I feel at home. Before I became a full-time vagabond, I was a traveler and a wanderer, never settling into one place with the idea I’d stay there forever. I grew up in LA, lived in the Hudson Valley, Boston, then Santa Cruz, and finally Seattle. All of those have one thing in common: each is completely different than the others. Manhattan really is like no other city on earth while Santa Cruz has a beach vibe that is uniquely its own. I lived in Boston 12 years, learning to live and die by the Pats and the Sox. In Seattle, the Space Needle was my true north as I learned my way around the city’s hills and alleys. Clockwise from top left: the Hudson River, Boston, Santa Cruz, and Seattle. In traveling for work, I came to feel like other places were home as well: the lively streets of Dublin, the waterfront of Sydney, the glorious castles and restaurants of Luxembourg, the cobbled streets and parks of Vienna. Clockwise from top left: Dublin, Sydney, Vienna, and Luxembourg. This vagabond life has widened my sense of place even more. I would never have dreamed that I would fall in love with the southwestern desert of New Mexico. Nebraska and Kansas were surprisingly diverse and beautiful, and the Blue Ridge Parkway so amazing I want to drive the full length of it from the Great Smoky Mountains to the Shenandoah Valley. Clockwise from top left: New Mexico, Nebraska, Kansas, and the Blue Ridge Parkway in Virginia. My wanderings have also strengthened my existing ties with with friends and with family. I’ve spent the last few months in Massachusetts revisiting friendships more than two decades old, enjoying the comfortable feel of hanging out, live and in person. I’ve met up with a friend from the UK on vacation in Cape Cod, and by phone, I’ve learned that a friend across the country is expecting her first child, a fact that will call me back to Seattle sometime in 2018, I’m sure, to celebrate that new life. Maybe I was born to be a wanderer, sliding comfortably into wherever I find myself in this world. Maybe my sense of place will never be one geographical location or one community but an endless combination of water, desert, forest, big skies, and a circle of companions spread across the globe. I can live with that. People develop a “sense of place” through experience and knowledge of a particular area. A sense of place emerges through knowledge of the history, geography, and geology of an area, its flora and fauna, the legends of a place, and a growing sense of the land and its history after living there for a time. The feel of the sun on your face or the rain on your back, the rough and smooth textures of the land, the color of the sky at morning and sunset, the fragrance of the plants blooming in season, the songs and antics of birds and the cautious ramblings of mammals are environmental influences that help to define a place. …Developing a sense of place helps people identify with their region and with each other. From our very first trip in 1966, my Dad and I didn’t stop seeing places together. So on this Father’s Day, the second one without my traveling buddy, here’s to 50 years of seeing the USA with him. While he was still working and I lived on the East Coast, we traveled from Philly to Maine, seeing the Jersey shore and the stone bridges of coastal Maine. As with most of our trips, he thought about things I wouldn’t have, like how stone bridges are made. Always the engineer, even on vacation. In 1999, he had a major stroke, and in 2000, I moved back to California to be closer to my aging parents. By 2001, he was back on the road, visiting me and the concrete ship in Aptos. He had seen a PBS show on it and that’s really all he wanted to see that trip, besides me. He wasn’t ready to fly yet, so I drove 500 miles to pick him up and a week later I drove that 500 miles again to deliver him home. One way my brother and I got him through the aftermath of the stroke and a grand mal seizure was to plan for NASCAR weekends. From Sonoma to Fontana, Phoenix to Las Vegas, we did at a couple of trips a year. He was a massive Jeff Gordon fan, as you can tell by the photo at the top of this post. One year, we splurged and paid for a behind-the-scenes tour of pit road. For an old Bonneville hand, it was two hours of pure heaven watching teams tune up cars, ready tires, and set up their pit road stalls. His other passion, replacing the tennis and golfing he could no longer do, became flight. He read extensively on all types of aircraft and could ID almost anything by sound or sight. When he said he wanted to go up in a glider, well, that’s what we did one fine Saturday morning in Hemet. That’s me behind him, on the far left; he and the pilot had a great time while I did my best to not need the airsick bag. Of all the photos from our trips together, I think this is my favorite. He’s at the airport, boarding pass in hand, ready to go. That’s how I will always remember him: excited as a little kid about the next trip. My traveling buddy, my dad. My father gave me the greatest gift anyone could give another person: he believed in me. In reading a lot of blogs by RV full-timers, it seems a standard practice to look at the year just finished in some fashion or another. I thought it would be fun look back and see what I did in 2016 as far as travel and campsites and mileage. Easiest one first, a map showing the states where I camped in 2016. Amber states means I spent 1-2 nights (mostly just passing through from Quebec to Seattle), while green means I spent a *lot* of time hanging out there. From June through the end of the year, I didn’t get out of the green states. That’s 49 different places that I figured out how to set up camp, find power and water, and survive the night. It definitely got easier after the first few weeks but showing up at a new campsite is always an adventure. Sometimes it’s great, sometimes not so much. Most of the time I stayed in state parks, with costs somewhat lower than RV parks and definitely higher than boondocking or free camping. My average monthly cost was $958, with a daily average of about $31/night. This first year, I chose to stay in parks rather than go off-grid and far from the madding crowds because I was new to this RV stuff and figured I would learn a lot by meeting other people and seeing their rigs and equipment. In 2017, I hope to do boondocking on BLM land and other free spots and save a bit on campsite fees. I also spent a lot staying in Santa Cruz the month of December (the priciest parks in my year, with an average cost of $53/night), choosing to splurge a bit so that I could see friends and have a good holiday season. Totally worth the extra money. Don’t ask me about gas cost. I have no idea. Well, I have it all in a spreadsheet, but I’m not going to pull it out and look at it because I might just die of shock. No wonder my baby needed a new set of tires this month! For fun, you can check out the 2016 Travel Log page, where I’ve also linked blog posts to locations. Coquille River RV Park, Bandon, OR. Honestly the nicest showers ever, and heated floors! Now it’s on to 2017 and more adventures for Bella, The Breeze, and me! Since I was 10 and my Dad took me on a trip to Yosemite, just the two of us, we’ve been the traveling buddies in the family. We’ve seen a lot in the 50 years since that first road trip, from the stone bridges of Maine to the rain forests of Vancouver Island, BC. We did a roadside geology tour of Arizona, taking the most meandering route from Phoenix to Prescott. We rode the funicular in Quebec City, drove the length of the Jersey Shore, and visited the concrete ship just south of Santa Cruz. Almost every year lately, I’d come up with a trip we could do, tailoring destination and length to match my dad’s advancing age. We were just starting to talk about the next trip, looking ahead to December. A lot of our trips involved aviation, his big interest in retirement. He came up to Seattle and saw the Concorde and Air Force One, toured the USS Midway in San Diego and March Field in Riverside, where he loved to look at the SR-71 Blackbird. On the BC trip, we stopped for lunch at a little park and when it turned out to be next to a private airstrip, he spent the time checking out the small planes coming in on approach. It all ended last Sunday. My traveling buddy passed away, quickly and painlessly, at 90 years of age. He was in his own home, still in control of his faculties, and still (very important to him) in possession of his car keys. He didn’t drive it any more, but he still had that car and that’s what mattered. To a lifelong traveler, having wheels was the thing. – Never take the same road twice. – Commit to the pass. Once you pull out, put your foot in it and go. – Keep going. You never know what you’ll find around the next bend. At some point in each trip, we would have a serving of his favorite ice cream, mint chocolate chip. I’ve searched for that stuff everywhere, scoring it from a local deli or a big chain store so the old man and I could have our celebratory signature dish. So here’s to you, Dad. You’ll be with me in Breeze, every mile and every bend in the road, every national park and every bowl of mint chip. Well, if I’m wrong and I hate it, I can always sell the trailer, keep the car, and figure out a Plan B. Sometimes I think most of my life has been in Plan B mode. Never got married, quit a good job in Manhattan and sailed on boats for three years. Moved to Boston on a whim, found a job, got my Masters. Traveled for work from Austria to China to New Zealand, and visited almost every cathedral in England between work weeks there. It’s not like I’ve ever had a five-year plan, or even a three-year plan. So maybe that’s what’s kind of scaring me now, I’m planning out 2-3 years ahead for the first time ever in my life. So I’m good at changing things up and surviving upheaval, especially the self-induced kind. So that’s a point in my favor. Uh, no. I don’t. No idea. I went to a trailer hitch website and within five minutes was completely overwhelmed by the variety of hitches available for my make and model of car. Ball thing, square tube thing, 5 wires, 7 wires? Yikes. I’m a techno-nerd and I make my living learning new geeky things like how to build systems in the cloud or ETL bits into a data warehouse. But that page of hitch options made my brain melt. Then ” the little voice that could” starts fighting back against Eeyore. Ah, there it is. The me that hates to ask for help. The me that underneath the Plan B change-ups and learning new stuff in every job is a control freak. And this nomad thing is something I don’t have under control yet. Not even close. So there it is. I am making lists of things I need to buy, things to get rid of, things to learn, checklists to construct for setting up camp, breaking down camp, hitching up the trailer, unhitching it. I keep thinking that if I make enough lists, I’ll nail this nomad thing. But nailing it, having everything under control with no loose ends or unknowns is not the point. Let me be clear to myself on this: the point of going nomad is to NOT know what’s coming, not have a same-day-every-day life. Yes, some things need to be known: how to get the trailer on and off the car (once I figure out what hitch I need on the car, that is! ), how that pump-out deal works, and how much (or more accurately, how little) stuff I can take with me when I go. This just might be the scariest thing I’ve ever done and I’m not even doing it yet. Some nights I lie awake staring into the darkness and wonder if I’m crazy and if it’s optimism and not pure naïveté that makes me think I can pull off this nomad thing. Some days, like today, when I look at the list of all the stuff I’ve sold off, given away, or donated, I wonder what the hell I’m doing and if in a few years, I will want all of it back. Maybe it’s just the place I’m in right now: committed to the idea of traveling around the country as a sole feme, but without the pieces in place, I have too much time to think about things and second-guess myself. Maybe that’s why I bought the Subaru Outback now, 11 months ahead of when I’ll actually need a tow vehicle. Maybe I just needed something concrete that I could look at and say to myself “See, you’ve begun” and stop worrying so much about whether I’m going in the right direction. The white-haired couple walks across the grass slowly, carefully, hand in hand. They smile at each other as they go. A church bell tolls, 1, 2, 3… for no reason I can see except that it shows 5:29 PM on my phone. The dark grey clouds scud across the blue, covering the bright with darkness. I mapped a new route home from work here in Seattle, but instead of following the plan, I went straight instead of turning left and found a poetry garden, rocks holding quotations of love and loss, as if it was waiting for me today, five years on from the day my mother died. I can hear people all around me at this park, and the occasional dog and owner pass through this little rock garden but they don’t stay any longer than it takes the dog’s nose to determine there is nothing of interest to canines. Me, on the other hand, I can’t leave yet. I pull out my notebook and start writing. Amidst all the new beginnings here for me, there is one constant unfinished thing that has followed me here. Will I never get over my mother’s passing? I thought I had, but knowing I am now in Seattle, in the first place I’ve lived that she never knew about, has been hard. I can feel the tears gathering, then sliding down and dropping onto my shirt. Some of them I wipe away hastily as if any of the strangers here would even notice, let alone bother to ask why. So despite my best intentions to honor this day on the calendar as Emma’s birthday (she turns 6 today, meaning her dad, my mother’s oldest grandson, spent her entire first birthday at the hospital waiting for his grandmother to pass away), all I have thought of today is my mother. The immediacy of that day five years ago, the pain of driving eight hours down to LA knowing she would never leave that hospital, then looking into her vacant eyes, not feeling her hand squeeze mine as I talked to her, all that has faded. The sorrow is now a different kind, the deeper ache of being left slightly adrift, a motherless child despite my age. I think of all my mother has missed in these five years. Besides me moving to Seattle, there have been two new great-granddaughters in Wisconsin: Eden, who she knew was coming and Eliza, her younger sister and the third in the trio of Wisconsin girls. There’s another great-granddaughter, Elliot, the wide-eyed blue-eyed first child of her grandson Dave. Another grandson, Kevin, one she spent so much time and energy raising from age 7 onward, got married last year. And I’m not the only one who’s moved: her oldest child, her only son, moved this summer to be closer to those Wisconsin girls. But for the two who’ve moved away, one moved back, the youngest child, a daughter whose difficult years caused her much heartache. That daughter is now the one who drives Dad to the almost endless round of doctors’ appointments, to the grocery store, and, on a good day, out to lunch. And Dad himself has moved too, from the top-floor east-facing apartment that was the wrong temperature no matter what the season, to a second-floor west-facing window that lets him sleep in easier. And despite her worries that he wouldn’t be able to get along without her, he’s done pretty well so far. He’s got friends, family, his movie and sport TV channels, and Google Maps on the big iMac screen (another new thing). He still misses her, as do we all, but we’ve all gone five years without her and we’ve learned to get by. It doesn’t mean we love her any less or that we’ve forgotten all that she was. It just means that some goodbyes never end. I learned about the Dawn spacecraft that would use ion propulsion to study two asteroids, Vesta and then Ceres, and stream the information back to earth. 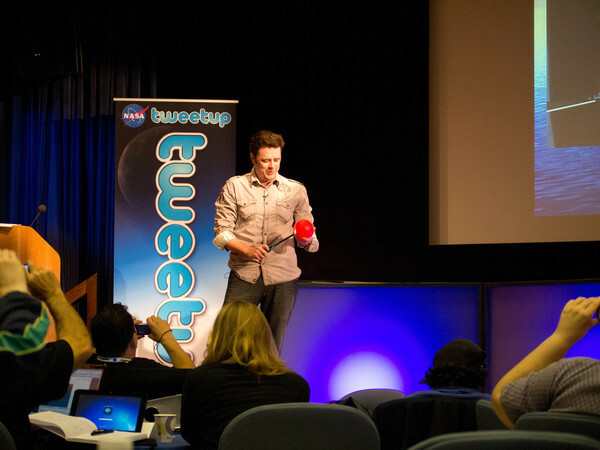 The scientist spoke about spiral orbits and slingshot moves as if it was everyday stuff. OK, maybe it was to him, but to me, it felt like my brain was scrambling to find new cells to absorb everything. And that was just the beginning of the day. More than a dozen speakers took the time out of their busy workdays to share their knowledge and excitement about their projects. It was so awesome that “awesome” doesn’t begin to describe it. Voyager 1 and Voyager 2, the original explorers of our solar system, were presented, with a great graphic that showed just how far it is to the end of our solar system. 16+ light years away, they’ve been moving away from Earth since 1977 and they’re still going, transmitting bits of data back to JPL. As the program manager spoke, a replica of Voyager, down to the Golden Record, was sitting to my left. Now *that* is a cool auditorium. Aquarius, the Earth-orbiting mission to study water and salinity, came complete with a demonstration of how global warming works by heating a balloon filled with air and watching it burst, then seeing the same flame not cause a water-filled ballon to blow up. Water absorbs heat better than air, that was the lesson, but I have to admit the balloon demo was cool all on its own. My high school science class was never like that, sadly. We heard about GRAIL, the twin spacecraft that would map the moon more closely than ever before and Juno, soon to start its five-year trip to Jupiter, my favorite planet. 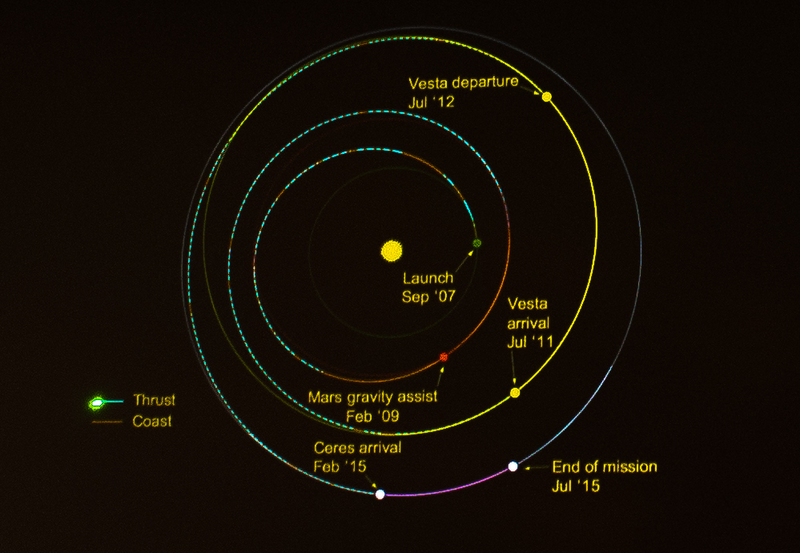 Forget Star Trek, this is a real five-year mission, one tiny little spacecraft crossing most of the solar system to get to the gas giant. 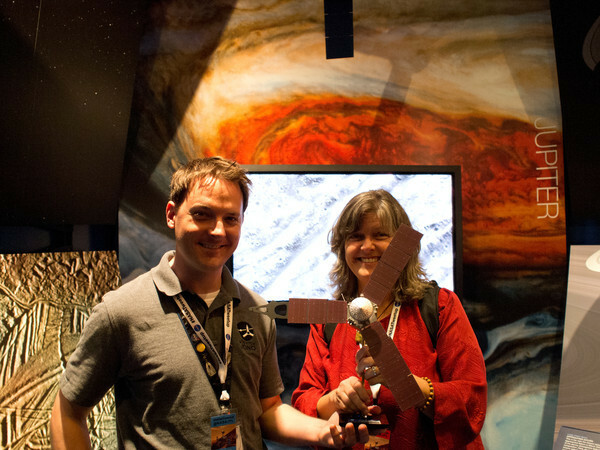 In the Visitor Center, I got to hold a model of Juno, which was a thrill hard to explain. We met Curiosity, albeit through glass in the clean room. 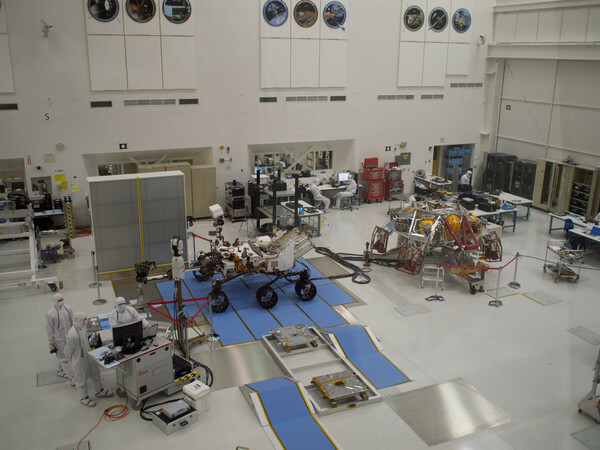 Mars Science Laboratory, nicknamed Curiosity, was undergoing final tests before being packed up for the trip to Kennedy Space Center and launch in November (which I was so lucky to see in person!). One of the lead scientists gave us an overview of MSL and then answered a ton of questions as we watched the clean room technicians run some tests. One of my favorite sessions was mostly unplanned, a sit-down with a Mars Rover program manager and two Rover drivers remembering the Mars Rover Spirit, which had recently been given up as lost after a year of not responding to commands. I fell in love with the whole lot of Mars robotic machines listening to these three people talk about Spirit, and Opportunity, and working with them for seven-plus years. And one very enthusiastic guy, the inimitable Doug Ellison, printed out poster-size paper for each of us to hold, designed to provide a special farewell to Spirit, and used a powerpoint to explain how it would all work. It was a combination of passion and geekiness that, in the months to come, would personify all that I love about the day at JPL. I loved my page so much I framed it and it hangs in the hallway where it makes me smile still every time I walk past it. For one special day, all of us were treated to insider’s view of JPL and NASA projects and it’s something I’ll remember forever. I’ll remember how as projects were presented, the back of the auditorium would fill up with team members, wanting to see what we thought of their work, excited to share it with us. I’ll remember the rock-star standing ovation given to John Casani, who’s been working at JPL since the 1950s on everything from Pioneer and Mariner to Galileo, Voyager, and Cassini and the surprise on his face as the whistles and cheers lasted more than a minute. I’ll remember seeing a moon rock from a foot away, looking down at Mission Control, and seeing people who make scientific discoveries and then figure out ways like NASA Eyes to share them with the rest of us. Most of all, I’ll remember that this one day expanded my world from our Moon where Grail has now finished the initial mapping work, to Mars, home to two Rovers and soon to Curiosity, on to the asteriod belt where Dawn is now finishing up the investigation of Vesta before turing to Ceres; to Saturn where Cassini still toils, on to Jupiter where Juno is headed, and all the way to the edge of our solar system where the Voyagers continue on where we can only dream of going ourselves some day. 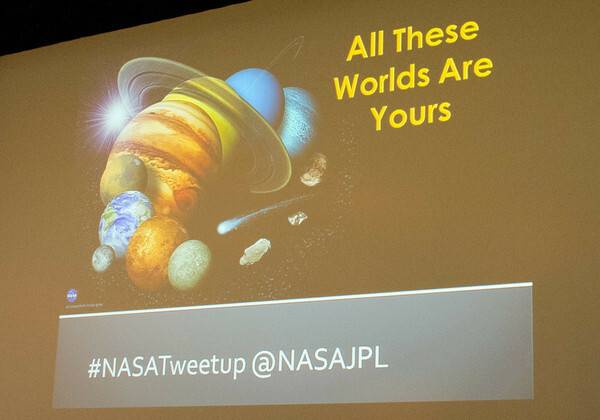 Thank you to everyone at JPL and NASA who made this day happen. I think everyone I know has heard about my day at JPL, and now I’m kind of referred to as the “space nerd” in my various circles of friends. I point out the #ISS overhead to the carpenter across the street, I show Saturn and Mars in the night sky to bikers in the hotel parking lot, I chat with a total stranger as I borrow his solar filter to see the Venus Transit. A year ago, I would have not done most of these things. I didn’t know how much exploration is going out there in the rest of the solar system. I didn’t know, but now I do. And my life is all the richer for it. I’ve traveled to a lot of places in my life, from the back roads of the southwest to Japanese gardens and the Great Barrier Reef. And only twice in all that time have I stood in a place for the first time and felt absolutely in-my-bones certain that someone I knew, at some other point in time, had inhabited that place. The first time I had that feeling was standing on the western shore of Loch Lomond in Scotland many years ago. I still haven’t figured out who in my genetic timeline it was, but I knew one of my ancestors had been there, had lived there. The view of a specific mountain across the lake was so familiar that it was like coming home and yet I had never seen it before. The second time I had that feeling was today, looking for where my mother lived when she was a little girl. I had heard stories, but not many, about living down in the canyon and that there were rattlesnakes and her father worked at the pumping station. 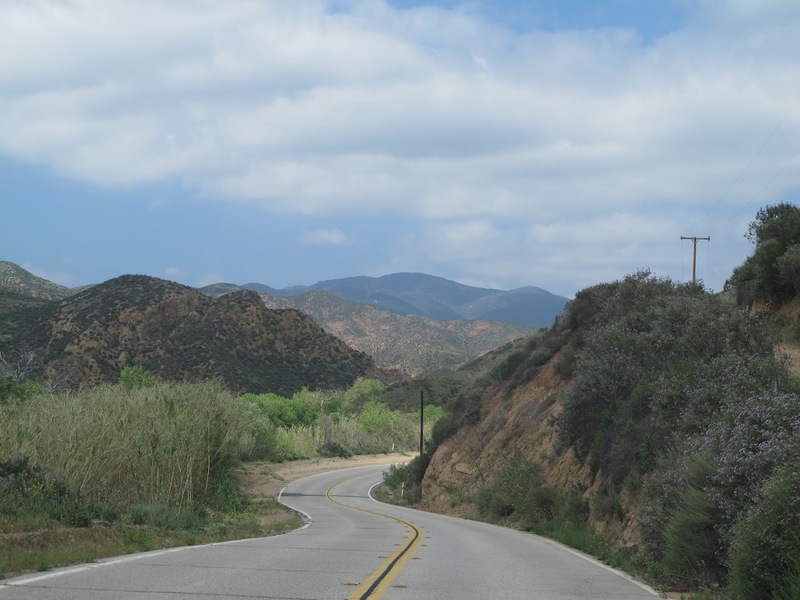 Given that lack of information, I wasn’t expecting much as I started the drive up San Francisquito Canyon from I-5. Almost too soon, I found Power Plant #2, off to the right and tucked into the side of the canyon. The gate was open so I walked around a bit. The building was destroyed in the breakage of the St. Francis Dam in 1928; this is the plant built to replace it in the early 1930s. I liked the details of the building, but I didn’t feel any connection to it. I tried to imagine my grandfather (who died two months before I was born, so I never met the man) walking into this building but I couldn’t get a mental picture of it. I shrugged it off and got back in the car, still heading north. I almost missed the faded sign for Power Plant #1, off on the right side of the main road and at the head of of a one-lane paved road that lead downward. I followed it around a few twists and turns till I was at the bottom of the canyon to a tiny settlement, 5 houses in all. It was literally a wide spot in the road. I stopped the car and got out. The place was deserted, although a few houses looked like someone still lived there, the others were lifeless and empty. I stood in the middle of the street and looked further down the road and that’s when it happened. I was absolutely sure this was the place my mother lived. I could feel it. There was another small group of houses a quarter-mile away, right next to the power plant itself, but that didn’t give me the same feeling. And the third small collection of houses, halfway up the hill didn’t match my mom’s phrase “down in the canyon” that I remember. 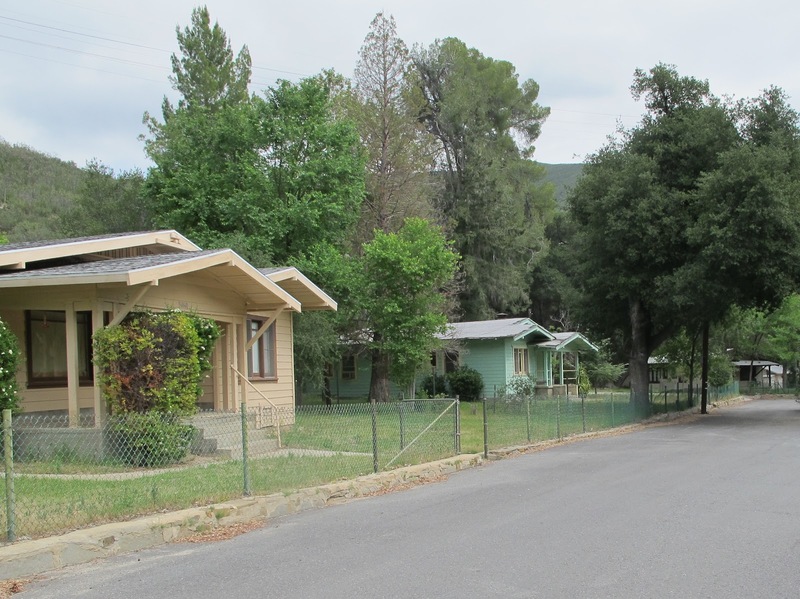 That first little set of houses is the one place I felt matched whatever my brain consciously and unconsciously remembers of my mother’s stories about her time there. She never talked about it much, and we never visited it, although it was probably less than 50-60 miles from where I grew up. 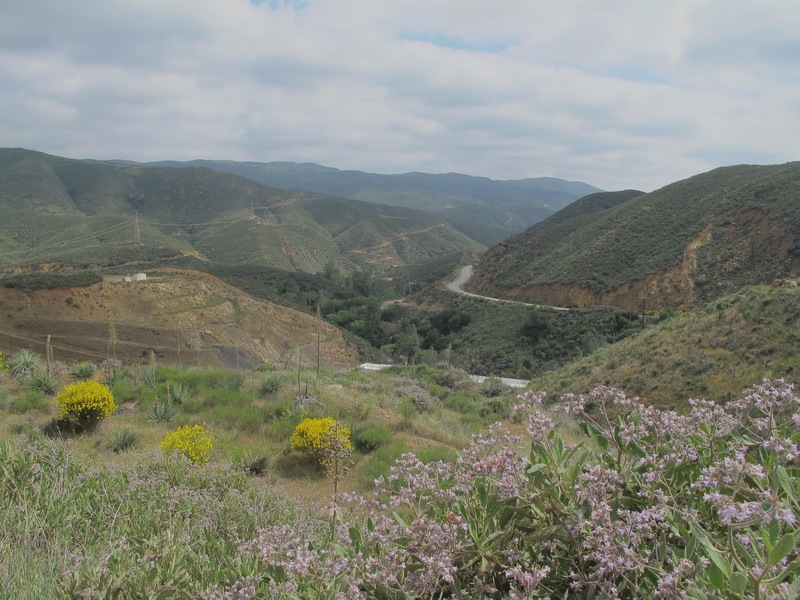 The journey up the canyon and down to the pumping station (what she called the power plant) has got me thinking about my mother, the life she had, and the secrets she took with her to her grave. I have a few old slides from her, but no albums, no concrete proof of anything about that little 8 year old girl who I know lived in that canyon in 1940, thanks to the recently released US census of 1940. I took one last shot at the top of the grade, looking back down at the canyon and said my goodbyes one more time to the mother I knew and the little girl I never did. Coda: Here is the sign that led me down that road to my mother’s past. 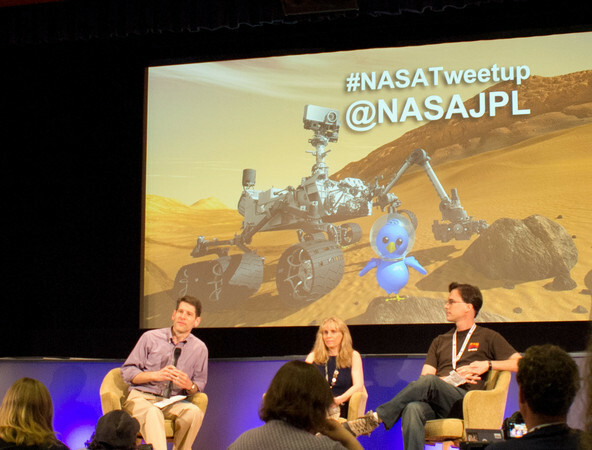 My alarm woke me up at 5:30AM for the MSL Curiosity launch and from then until 11AM, it was surround-sound, brain-engaged, full-on NASA Tweetup. We listened to Will.i.am from the Black-Eyed Peas talk about challenging and encouraging kids to get involved with STEM (Science, Technology, Engineering, Math).We were inspired by the energy and commitment of Bill Nye, The Science Guy. NASA Administrator and former astronaut Charles Bolden stood in the midst of the 150 people at the tweetup and gave a short passionate speech about how the MSL launch is the next step on the road to human space flight to Mars. 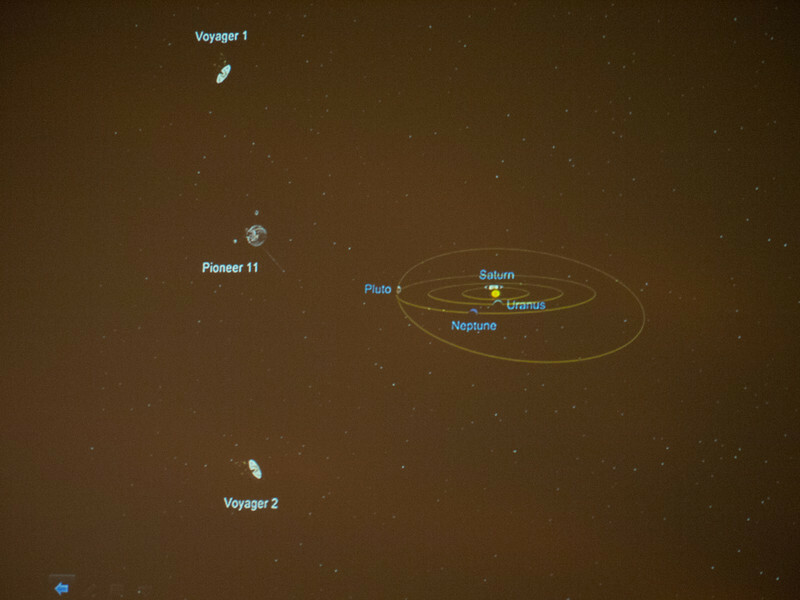 And JPL Visualization guru Doug Ellison gave a demo of Eyes on the Solar System, including the new 3-D mode, which is totally cool. All this and we still had not gotten to the rocket launch! And, yes, launch*was* the most amazing experience and I’ll write about it when I can figure out how to put it into words. Today, though, the other moment that sticks with me is actually a continuation of a moment from a launch I wasn’t even at, the last Shuttle launch (STS-135 for the space geeks). I had been following Doug on Twitter (@Astro_Wheels) because while he was aboard the International Space Station, he took some amazing photos of the Earth, and those photos are how I fell in love with all things space and most things NASA. But once I read the STS-135 story about that little kid, he became one of my heros (and I have exactly three now, so it’s a rarified club). My friend has an autistic kid and I love anyone who takes the time to be with Liam on his terms, not on theirs. That’s exactly what Doug Wheelock did with that little kid at STS-135. Yesterday, I actually got to meet Doug Wheelock, and he is as kind and generous in person as I imagined. And when he said he liked a pin I was wearing, I couldn’t take it off and give it to him fast enough. A little pin in exchange for what his works have given me? Such a deal! So, while I have launch photos and lots of amazing memories from this week, this might be my favorite picture. I look like crap, but I so don’t care. I got to meet Doug Wheelock! Copyright © 2019 Annie Wynn, all rights reserved. Website by Silver Rockets.